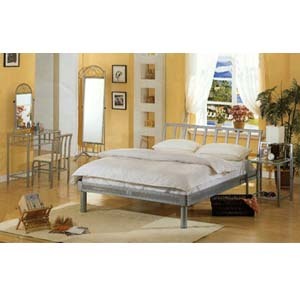 4-Piece Contemporary Silver Queen Size Bedroom Set. Includes: Queen Size Platform Bed With Support, Night Stand, Vanity Set And Cheval Mirror. Pieces Are Also Sold Separately. Details: 7601 (CO) Queen Bed: 87L. X 64W. X 36H.. 7602 (CO) Night Stand: 20W. X 19-3/4D. X 30H.. 7603 (CO) Vanity Set: Vanity: 29-1/8W. X 18-1/2D. X 30H.. Stool: 18W. X 18D. X 29-3/4H.. 7604 (CO) Cheval Mirror: 21-3/4L. X 19W. 67H.. Easy To Assemble.